Human-powered translation app enables anyone to get real-time human interpretation services anywhere, anytime. Stepes (pronounced /’steps/), the leader in mobile translations, has introduced its new over-the-phone interpretation services on mobile devices for individuals and businesses to obtain real-time translation services anywhere and anytime. 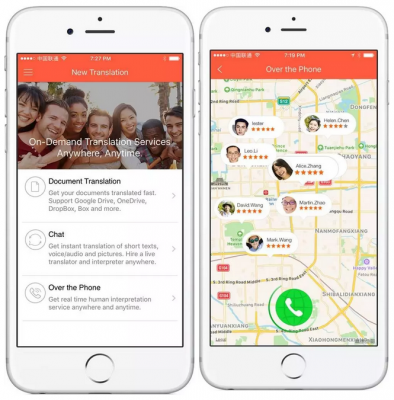 The latest translation app uses LBS (location-based service) technology and shared translation services model to automatically connect users with in-country native translators and interpreters all around the world, for instant and on-demand interpretation services in 100 languages. At the push of a button, users can view nearby translators on a map and connect with them quickly in order to meet their interpretation needs. Whether you’re a tourist, entrepreneur, business travelers, or a language learner, the Stepes app guarantees high quality translations are available anywhere and anytime. We live in a global economy with one major drawback – people are increasingly connected, but they can’t understand each other. The Stepes translation app is a game changer that uses the power of big translation in a sharing economy model to enable people to confidently communicate with others across language and culture barriers. “Because Stepes translators and interpreters are location-based, you are assured that your linguists are true cultural experts,” Yao explained. “They are always standing by to help you navigate the cultural intricacies of a new cross-border business venture or a new diverse culture. With a Stepes linguist by your side, you can navigate multilingual situations with confidence” Yao concluded. Stepes is the world’s first chat-based translation app. Stepes unlocks on-demand and accurate human translation services not yet witnessed from a mobile device. Stepes stands for Social Translation Experiment Project and Eco System and also refers to the Eurasian steppes, where the world’s 400 major languages originated from some 5,000 years ago. By seamlessly connecting businesses with the world’s translators through its translation eco-system, Stepes helps break down language barriers between businesses and their customers and among nations and people.